Kids at the Dinner Table, Am I Right?! We have a four-year-old daughter in our house. If you have kids, then I don’t need to tell you that 95% of the time she’s running the show. My wife and I try to be in charge, and we’re doing our best to fake it until we make it, but right now, I think she’s winning. This is especially true at the dinner table, where it’s rare for her to sit still and eat an entire meal without being distracted. That’s why I was pleasantly surprised to watch her eat Smoked Pizza pull apart bread without saying a word, and then asking for seconds. Kids Love Pizza Pull Aparts! This might not sound like much of an accomplishment, because every kid loves pizza, but we will take any victory at the dinner table we can get. 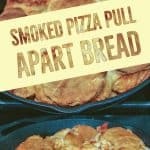 This cheesy pizza pull apart bread was simple to make, and turned out delicious. 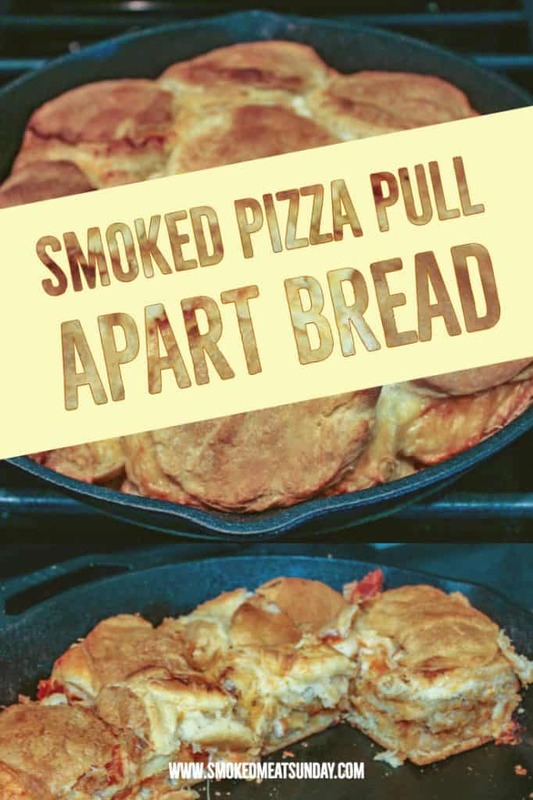 I smoked this pizza pull apart bread in a cast iron skillet, and was truly stunned at how great they turned out. The bottom of the pizza pull apart bread was golden brown, and the flavor was perfect! These did take a little bit longer to make than my grilled cheese bombs – which are also delicious by the way – but the extra time is totally worth it. I’m not gonna lie, I still had some leftover cheese from the smoked lasagna I was trying to use up when I made these… That recipe is also delicious if you haven’t tried it! Each package of butter biscuits has eight rolls. Open the package, and separate each individual roll into eight thin layers. This is the most tedious part of the recipe, but it’s totally worth it. Separating the rolls like this allows you to get as much flavor as possible into the bread. 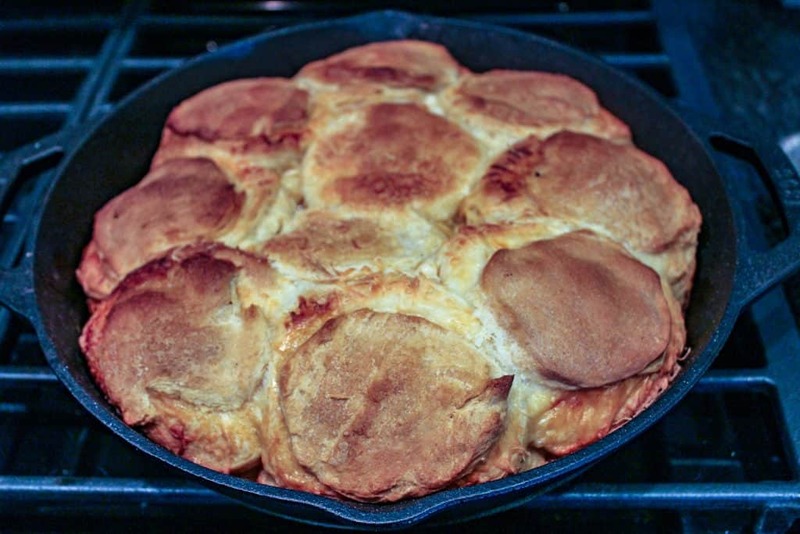 Once the rolls are separate out into eight layers each, it’s time to start building your pull apart bread in your cast iron skillet. Lay one layer of rolls down in the bottom of the skillet, then spoon a small amount of pizza sauce on each layer, followed by some mozzarella cheese, one pepperoni slice, and then some parmesan. Repeat this process until you’ve used all the layers. 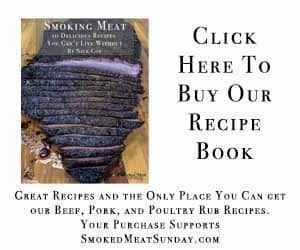 Now that your pull apart bread is constructed, it is time to throw it all in your smoker. The directions on the rolls said to cook at 350 degrees, so before you put your skillet in the smoker, get it up to temp. You’ve added quite a bit of mass to the rolls, so it’s going to take significantly longer for this smoked pizza pull apart bread to cook. When I made this it took about 45 minutes to for the rolls to soak up all of the moisture in the skillet, and turn a beautiful golden brown. Once they look perfectly cooked, pull the pizza pull aparts out of the smoker, let them cool for a few minutes, and then serve! We fed a group of eight with these and it was all gone in less than ten minutes! Feel free to experiment with the pizza fillings, and let me know if you try these out. I love seeing your pictures on Instagram, and reading your comments on Pinterest! We have a four-year-old daughter in our house. If you have kids, then I don't need to tell you that 95% of the time she's running the show. My wife and I try to be in charge, and we're doing our best to fake it until we make it, but right now, I think she's winning. This is especially true at the dinner table, where it's rare for her to sit still and eat an entire meal without being distracted. That's why I was pleasantly surprised to watch her eat Smoked Pizza pull apart bread without saying a word, and then asking for seconds. Each package of butter biscuits has eight rolls. Open the package, and separate each individual roll into eight thin layers. Lay one layer of rolls down in the bottom of the skillet, then spoon a small amount of pizza sauce on each layer, followed by some mozzarella cheese, one pepperoni slice, and then some parmesan. Repeat this process until you've used all the layers. 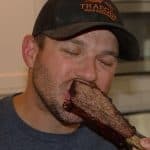 The directions on the rolls said to cook at 350 degrees, so before you put your skillet in the smoker, get it up to temp. Once they look perfectly cooked, pull the pizza pull aparts out of the smoker, let them cool for a few minutes, and then serve!